I have had the pleasure of working on an exciting project with colleagues within ASTI (Academic Support Technology and Innovation), which resulted in a journal publication. Part of this project was devising a means of making induction more exciting for the participants. 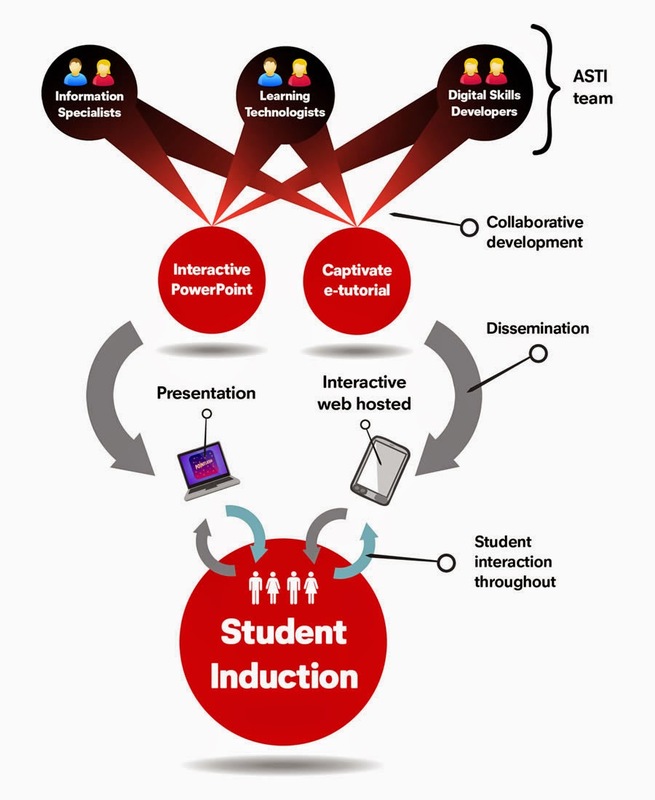 One approach used to increase student involvement was to create a game within the induction presentation inside PowerPoint, so initial contact would be much more exciting for attendees. This was based on the BBC show 'Pointless', although in this case, very much angled to University services and support specific questions (Special thank you to the BBC for giving the University permission to adapt their game show idea in this project). Thanks also extends to the ASTI team collaborators involved in the development work for this project. The digram to the left gives a visual description of how this works. MOODY, J. & TRUSCOTT, J. 2014. Enhancing student induction to library and IT services in higher education. Innovative Practice in Higher Education, 2. UPDATE: similar processes are now being implemented in 5 external institutions.